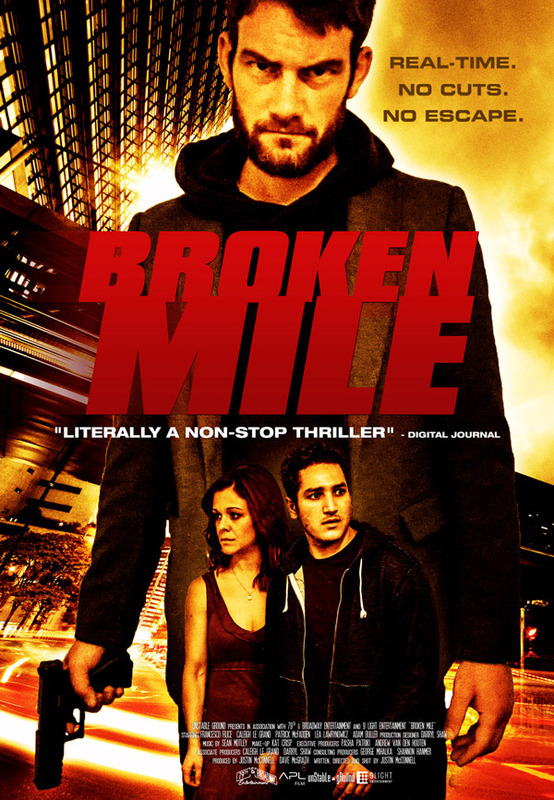 Director Justin McConnell’s visceral single-take thriller “Broken Mile” will begin it’s international theatrical release in Toronto, Canada on July 28, before expanding into USA cinemas August 4 in Portland, OR, followed by San Diego, CA, August 8, among others throughout the summer. Indiecan Entertainment will release in director Justin McConnell’s native Canada and Gravitas Ventures will release it in the USA beginning August 15 on VOD/Digital/ DVD and Blu-Ray. “Broken Mile” world premiered at Whistler Film Festival, followed by Toronto’s Canadian Film Festival earlier this spring. “Broken Mile,” told in pulse pounding real-time and presented as a single unbroken take, follows a drug-addict (Francesco Filice) who awakens to find the woman he is with dead, and must rush to escape the consequences. Along the way he enlists the help of his strong-willed ex-girlfriend (Caleigh Le Grand), and avoids confrontation with the gun-toting figure chasing him (Patrick McFadden). The film was produced by McConnell’s company Unstable Ground, in association with Pasha Patriki’s 9 Light Entertainment, and executive producer Andrew van den Houten’s (“Jug Face,” “The Ranger”) 79th & Broadway Entertainment. “We are excited to bring “Broken Mile” to theatrical audiences, as well as to homes across North America this summer. The audience is in for a character-driven ride” McConnell said.